Mr P. Spring/Summer 2019 Collection is the Mr. Porter’s own label has gotten us used to quality staples with a clean aesthetic and this season is no exception. It’s interesting to see how it has slowly evolved into a sophisticated range of contemporary, up-scaled pieces, that seamlessly fit into the wardrobe of the modern man, almost regardless of style. This tactile piece – rendered in a loop-yarn fabric that has an almost terry-cotton feel – can be considered the missing link between your favourite checked shirt and your favourite zip-up bomber. Just heavyweight enough to earn the name “jacket”, it’s an eye-catching way to pep-up your downtime wardrobe and will look as good with jeansas it will a sharp pair of chinos. From formal to casual, the collection welcomes a range of menswear essentials with a cool, relaxed vibe that beautifully portrays the current state of men’s fashion. In MR PORTER’s opinion, spring is one of the most gratifying times of the year to get dressed. It’s warm, but not too warm. Sunny, but not too sunny. And you have to pile on a few layers of clothing, but not too many. Of course, this can also be a problem. With versatility comes choice; with choice comes indecision; with indecision… mistakes. Yes, it sounds like the tagline for a Marvel movie, but actually, it’s just life. Naturally, then, we tried to keep things as simple and mix-and-match-able as possible when developing the April drop from our own in-house label, Mr P., a range of clothing we created to combine ease and comfort with sartorial sharpness. This is a good way, in general, to think about how to dress in spring: you want everything to look considered and put together, but also rather breezy, as if you’ve not really thought about it all that much. This collection, therefore, is all about convenient layering. That subtle art of placing one thing on top of the other so that you can dress yourself up or down according to the whims of the sunshine and whatever air-conditioning unit you happen to be in front of. As such, the core of this particular drop has to be the wide selection of lightweight outerwear pieces, at least one of which we would recommend as a constant companion at this time of the year. But we didn’t stop there, of course. Our top-to-toe investigation into the best things to have right now includes a new version of the classic linen trousers, lightweight knitwear pieces that will become fail-safes on your next city break. Mr. Porter even added some beach-appropriate pieces – after all, that most pleasant and sandcastle-filled time of the year is now imminent. Within this collection, though, there are a few pieces we think are worth special notice. The shape of this pieces is reminiscent of the traditional French “bleu de travail” chore jacket. 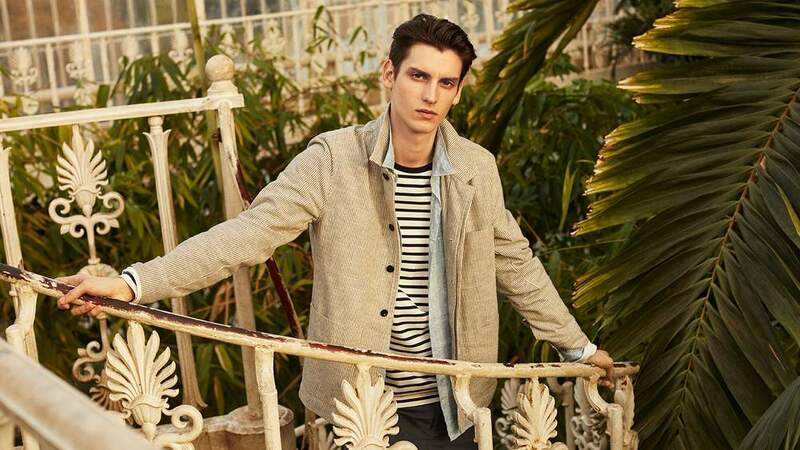 But in a railroad-striped slub-cotton fabric that lends it more of a Japaneseworkwear feel, this jacket is designed to merge seamlessly with the rest of your spring wardrobe. The neutral shade means it couldn’t be easier to mix and match; just throw it on over a linen shirt and striped tee, and off you go.